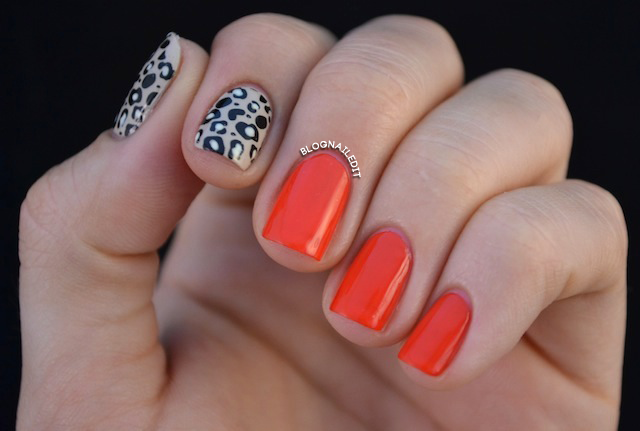 I've been wanting to recreate this manicure since I first saw it at Marta's blog, ChitChatNails. Her manicure used different fingers for the leopard accent, as you can see here. I wanted to do my first two fingers as the accent nails, and I decided to start calling this type of pointer/thumb accent combo a pistol accent. Pretend like you're shooting a handgun. Which two fingers did you use? See...pistol accent! The bright red I used is another score from the ridiculously cheap beauty supply store a reader pointed out to me near Boulder. It's Tasmanian Devil Made Me Do It (OPI). It's soooo bright and I'm thrilled it's part of my collection. I have one other red that comes close, but it's not bright with that orange-red feel. The base for the accent nails is Farah (Zoya). I used the m57 Konad stamp rather than freehanding the leopard spots. They're filled in with Load (Illamasqua) and stamped with Black Creme (Wet n' Wild). I literally can't stop looking at my hands. Thanks for the inspiration Marta!!! ooh this reminds me of trigger mittens! i think they might be a Newfoundland thing, but they are mittens with your index finger separate! you could call it a trigger mani as well! Damn that's witty! I may change this to be the Trigger Finger mani instead. We should do something really awesome featuring this new title! Ah I was TOTALLY thinking of recreating her mani today too, but decided against it.. now I'm regretting it because this is amazing! love the coral and the beige combination!! I totally made a gun with my fingers when I was reading your explanation of the name. I love it! Pistol or trigger, both pretty clever. Love the combo, love the name even more!